With a deft hand, New York Times bestselling author Jane Kirkpatrick draws out the emotions of living--the laughter and pain, the love and loss--to give readers a window not only into the past but into their own conflicted hearts. Based on a true story. A life without a purpose is a story without an ending. Based on a true story Everything She Didn’t Say is Carrie Strahorn’s story of her life traveling the American West. I enjoy reading about strong women of the past, especially ones I am unfamiliar with, such as the case here. Told from her point of view she tells her story of the struggles and hardships they encountered not just with the dangers of travel but within their marriage relationship, financial and the family Carrie left behind. 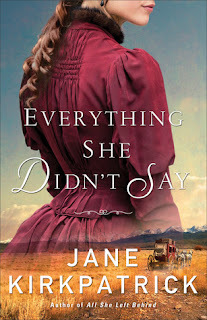 This is my first time reading Jane Kilpatrick, I was impressed with the research that went into this book, the endless traveling made me tired for Carrie. The chapter structure was something a little different with each one ending with a piece from Carrie's actual memoirs. There wasn’t a lot of action to keep me glued to the pages and at times I felt things a little repetitive and slow. But I enjoyed learning of both Robert and Carrie Stratton and their lives from the past.